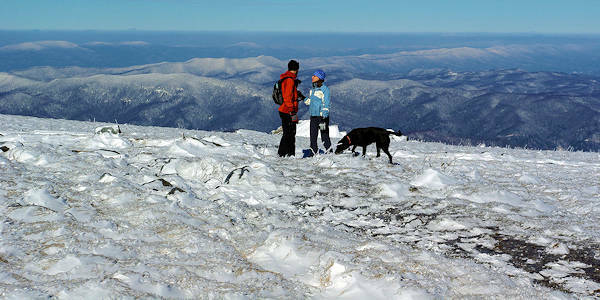 Looking for a great winter hike? 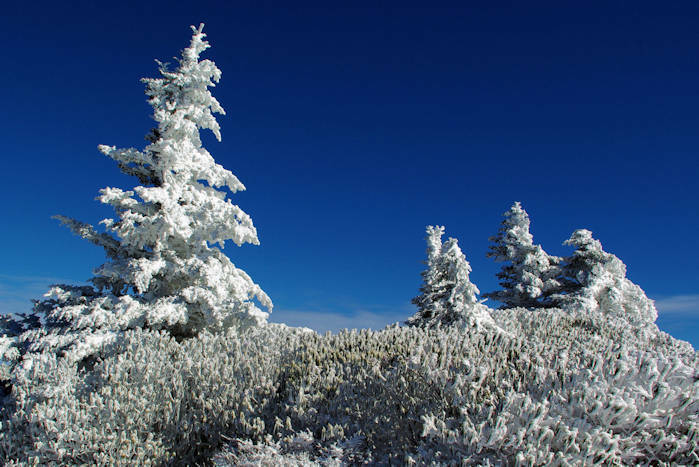 Bundle up and head to the Appalachian Trail at Roan Mountain, located near Bakersville. 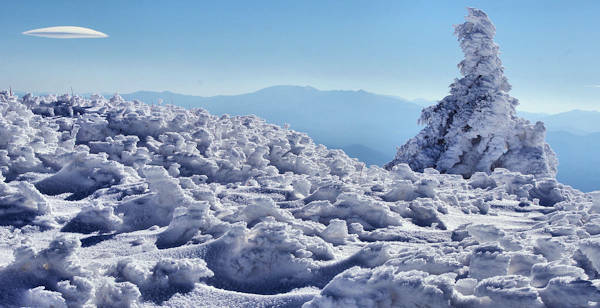 It is frequently blanketed by snow and rime ice in the winter. From the NC Highway 261 entrance to Roan Mountain Recreation Area (Pisgah National Forest) at Carver's Gap on the North Carolina / Tennessee state line, it's a fairly easy climb (300 foot elevation gain) to Round Bald (5,807 ft) for great panoramic views - a 1.5-mile roundtrip. You can continue to hike across additional balds. 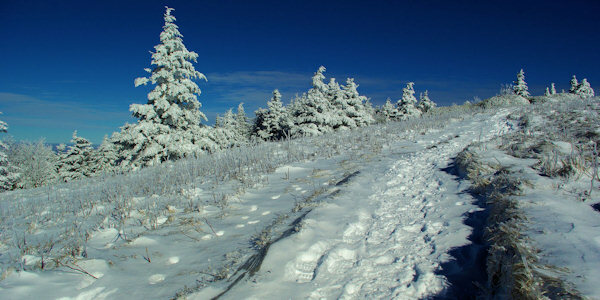 See our Roan Mountain hike guide for details. 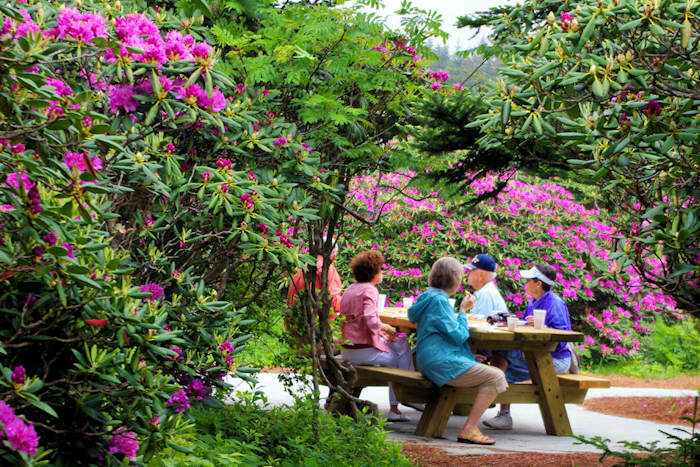 On the 12-mile drive from Bakersville, you'll climb about 3,000 in elevation. In the winter, the temperature will often drop 15-20 degrees by the time you reach the gap. Dress appropriately. High winds along the ridges often drops the wind chill below zero. Read more about this scenic drive. In late October 2012, a rare snow storm that was caused by a hurricane created blizzard-like conditions. Watch the video above or see our snow photos. 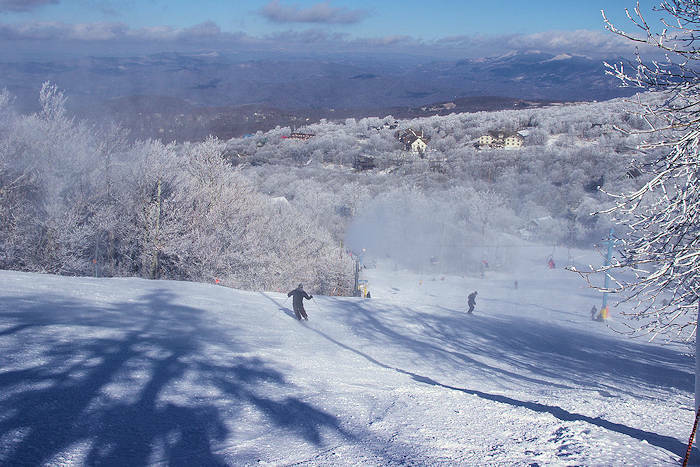 Remember, while Asheville may be sunny with no snow and temperatures in the 40s, Roan Mountain can have a deep snow with highs in the 20s. 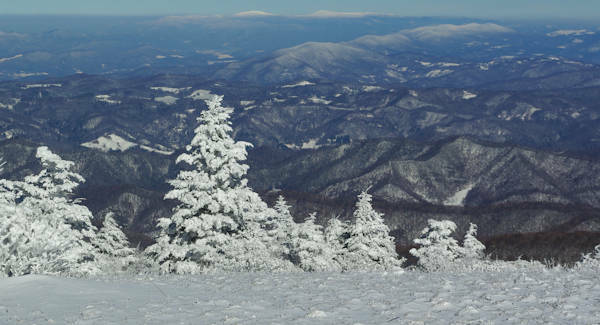 Read more about Roan Mountain. There are several ways to get to Roan Mountain. 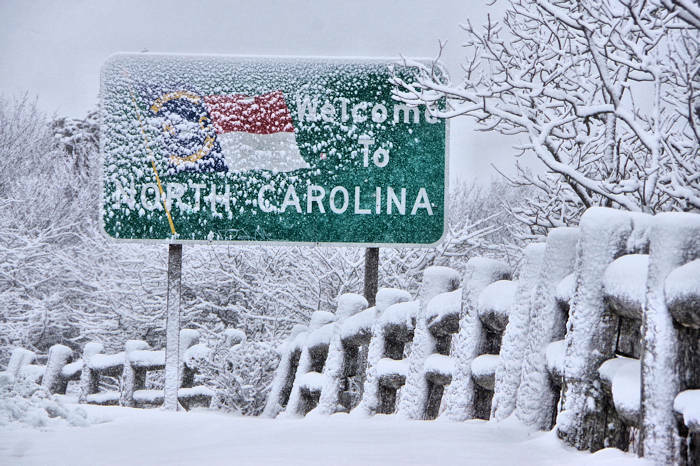 It's about 13 miles north of Bakersville, NC on Highway 261. Be ready for curvy, mountain roads. Check the weather forecast: Remember that it is often 15-20 degrees cooler in the higher elevations than in the valley around Asheville. And it's usually more windy. So on very cold days, plan a hike at a lower elevation. The best website to check local weather in the North Carolina mountains is RaysWeather.com. Don't hike if wind chills are near or below zero. Frostbite can occur quickly. Bring a map or GPS: Snow covered trails are difficult to follow. Know what color blazes to follow and make sure they are visible (usually attached to trees). Dress in layers: Wear a layer of clothing with wicking properties next to your skin (not cotton). Wool and synthetics are your best bets. Get advice at an outdoors store. Wear several layers so you can remove layers as you warm up. Even on frigid day, you will warm up quickly if you are hiking up a mountain. Always take water resistent gear since weather can change very quickly. Eat and drink more: You burn more calories hiking in the winter, especially if you are hiking through snow. So take snacks and protein bars. Also, humidity levels are often very low, so you can dehydrate quicker. So take plenty of water. If it is below freezing, tuck the water inside your clothing to keep it from freezing. Take your cell phone: Although cell phone signals are spotty in the mountains, it won't hurt! Keep spare batteries warm: Cold weather can drain batteries quickly. So keep your cell phone inside your clothing to keep the battery charged. And keep extra camera batteries in your pocket to stay warm. Photograph: Take a camera to capture amazing views and wintry scenery. Plan ahead: Tell someone which trail you are hiking and give them a call when you are finished. In case you get lost, your friend can call for help! Take first aid supplies: Be ready to treat scrapes and scratches. Light: Take a flashlight in case you get caught in the dark on the shorter winter days. 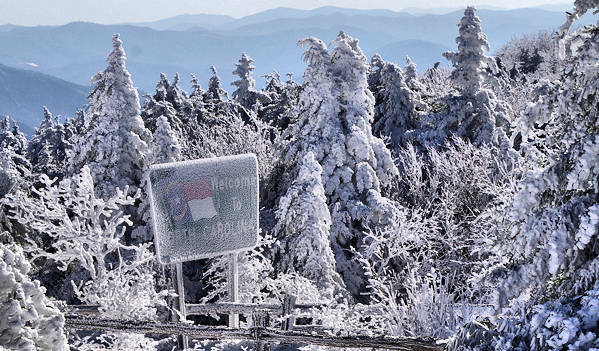 See our favorite winter hikes near Asheville!